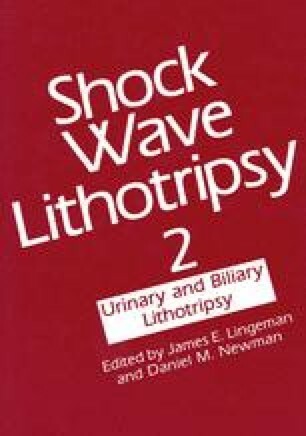 Considerable controversy surrounds the capacity of shock wave lithotripsy to cause soft-tissue injury. This study examines the influence of different numbers of shock waves (SW) on the gallbladder in both human and animal models, employing an EDAP piezoelectric second-generation lithotripter. Animal studies. Sixty-one guinea pigs were divided into four groups and subjected to different numbers of SW. In the first part of the study all animals were sacrificed at 24 hours following lithotripsy. In addition, further groups of animals received divided doses of SW in an attempt to examine the possible cumulative effects of repeated administration of SW. Finally two groups of animals which received high-dose lithotripsy were sacrificed at two and four weeks, respectively, following SW exposure in order to determine the reversibility of injury. Detailed analysis of the data revealed that soft-tissue damage following SW exposure is related to the number of SW administered. In addition, repeated administration of low dose SW appeared to present the development of the soft-tissue damage apparent in animals receiving a high dose in one session. Finally in those animals sacrificed several weeks after receiving high doses of SW, no soft-tissue damage was evident, indicating that these changes are reversible. Human studies. Thirty consecutive series of patients were subjected to either high-dose (36,000 SW) or low-dose (6,000 SW) lithotripsy 24 hours prior to elective cholecystectomy. In addition a further five patients who were considered failures of therapeutic lithotripsy had elective cholecystectomy after six treatment sessions (6,000 SW per treatment). Both macroscopic and microscopic evidence of soft-tissue injury was detected in a significantly higher percentage of patients who received a high dose of SW in a single treatment session. The patients who received 6,000 SW in a cumulative fashion showed no evidence of injury. Therefore, repeated administration of low-dose SW appears safe in terms of soft-tissue damage. However, safety parameters for different types of extracorporeal lithotripters should be established prior to widespread clinical application.